Muhiuddin Muhammed Aurangzeb was born on 3 November 1618 at Dohad near Ujjain. Aurangzeb's rule is characterised as a dark period for his non-Muslim subjects. It saw revolts by many Hindus who were otherwise loyal vassals of the Mughal throne: the Jats, the Rajputs, the Satnamis, the Marathas, the Bundelas and the Sikhs. Aurangzeb was a fanatic Sunni Muslim whose rise to the throne was as bloody as his reign. He had his brothers killed and his father imprisoned in order that he might ascend the throne of Delhi. He was the first Mughal ruler to impose Sharia law on his subjects and expected everyone to follow the fundamental codes of Sunni Islam. He persecuted even the Shia Muslims and the liberals amongst the Sunnis. He awarded the strictest punishment for blasphemy and compelled his non-Muslim subjects to accept the Islamic faith. He also imposed the hated jazia tax, the pilgrim tax, and the trade tax (a charge of five per cent of the value of goods) on Hindus specifically. He did not even spare his mansabdars, his vassals, and he tried his utmost to convert them to Islam, by pressure, bribes or by force. He banned Hindu festivities in the court premises. He forbade Hindus from having good horses, disallowed them from keeping Muslim servants, and allowed palanquins only for his most loyal Rajput officers. He even appointed 'Muhtasibs', or enforcers (a new class of officer), of his brand of morality and Islamic law. During his rule there was a ban on the creation of new schools for Hindus, as well as on repairs to old temples. He destroyed the temples of Vishwanath at Benaras, Keshav Dev at Mathura, and the Somnath temple at Patan, and these were just the more prominent casualties. He ordered construction of mosques in their place. His aim was to convert India from the 'Dar-ul- harb' (the land of infidels) into 'Dar-ul-Islam' (land of Islam). He drove out all dancers and artists from his court and banned music of any form. In fact, his rule can be compared to that of the Taliban in more recent times. He himself adhered to the strictest version of Islam. He led a very austere life. He was a regular 'namazi' (prescribed praying in Islam). He remained a teetotaller all his life, and never kept more than four wives as instructed in the Quran. He woke up every day at five in the morning and personally supervised every aspect of governance, allowing himself only five hours of sleep a night. He also banned drinking, gambling, and prostitution, and the practice of Sati amongst some Hindus. He was very hard working and laborious, but he was also a very able commander and often led his forces on the battlefield. He was well-versed in Persian, Arabic and Turkish and was proficient in the art of politics, which was well served by his extremely shrewd and crafty mind. He preferred calling himself an enlightened despot. But one thing is certain, all his good qualities were outweighed by his religious bigotry and fanaticism. He even confessed to his son in his last stages that, "he has sinned terribly... and didn't know what fate awaited him in God's kingdom". While Aurangzeb ruled, he ruled with a iron hand, but his policies of Islamising India sowed the seeds of a gradual decline in the Mughal empire. This was the first organised rebellion against Aurangzeb. In Mathura a local Muslim officer named Abdul Nabi had destroyed a temple and erected a mosque on its ruins. This was in 1661. He was also said to have harassed the local Hindu populace on a regular basis. Simmering resentment against him gave vent to a revolt by the local Jats  under a person called Gokul. In 1669, Gokul killed Abdul Nabi and looted his tehsil at Sadabad. When Aurangzeb heard about this he ordered the destruction of the Keshav Dev temple in retaliation in 1670. This further inflamed the Jats. They collected together in numbers amounting to around 20,000 and attacked Mughal posts. Aurangzeb took the matter most seriously. He took on the Jats at the Battle of Tilpat. Gokul was killed and his followers were punished severely. In 1686, under the banner of Rajaram, the Jats again revolted. Rajaram was killed in 1688. But resistance continued under his nephew, Churaman, until Aurangzeb's death. Later, the Jats were successful in establishing their independent kingdom with Bharatpur as its capital. The Satnamis were a religious sect who also went by the name of the mundiyas (the bald) because they shaved their heads. What started as a quarrel between a Satnami peasant and a Muslim soldier grew steadily. The Mughal army quelled that revolt killing over two thousand Satnamis. This was a major revolt in the lifetime of Aurangzeb. Sikhs are a martial community from the state of Punjab which began as an offshoot sect of Hinduism under Guru Nanak. They came into conflict with the Mughals when, for helping his rebellious son, Khusrav, Jehangir had their fifth Guru, Arjun Dev, killed. 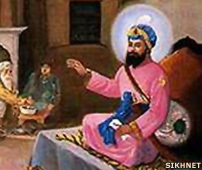 He was succeeded by his son, Guru Har Gobind. The Sikhs had by now raised their own army, and opposed the Mughals openly. There were a few skirmishes between the Mughals and the Sikhs, but these had subsided with the death of Har Gobind in 1645. 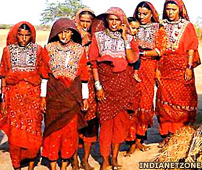 The Jats were an ethnic community in northern India, mainly in the Punjab, with a mainly agricultural background, who some scholars identify with the ancient Getae and Scythian Massagetae. 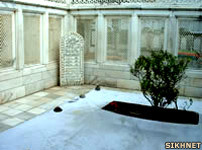 His successor Guru, Har Rai, maintained good relations with Shah Jahan's son Dara Shaikoh (Aurangzeb's rival brother). Aurangzeb therefore disliked the Sikhs. When Har Rai died in 1661, Aurangzeb tried to install his man, Ram Rai (an estranged son of Har Rai). The Sikhs however installed Tegh Bahadur (another son of Har Rai). Aurangzeb imprisoned Tegh Bahadur and forced him to embrace Islam. When he refused Tegh Bahadur was tortured for five days until his death in prison in 1675. Tegh Bahadur's son, Guru Gobind Singh converted the dormant Sikhs into a warrior community and took on the Mughals. He fought Aurangzeb throughout his life, until his death in 1708. The Rajputs had been loyal to the Mughals since their treaty with Jahangir. Raja Jai Singh, raja of Amer (modern Jaipur), and Raja Jaswant Singh (raja of the Rathore community of Marwar) were amongst the main commanders of the Mughal army. Aurangzeb always resented the special status of the Rajputs in the Mughal empire. He had malicious designs for them, but was waiting for the opportune moment. With the death of Jai Singh and Jaswant Singh away in Afghanistan. Aurangzeb decided to put his plan in action. He received news that Jaswant Singh had just died in Jamrud, Afghanistan (1678). The major body of the Rathore army of Marwar was in Afghanistan fighting battles for the Mughals. Sensing a weak defence and a vacant throne, Aurangzeb attacked Marwar. He captured the forts, destroying several temples on the way. Then he humiliated the Rathores further by selling the Rathore throne to his vassal, the chief of Nagar, for 36,000,000. Jaswant Singh's son, Ajit Singh, was an infant and in the care of Jaswant Singh's aide Durgadas. Aurangzeb tried to install a milkman's son on the Marwar seat. But the people revolted. Durgadas had already declared Ajit Singh as the new raja of Marwar, and the people had supported him. Durgadas raised an army to fight against Aurangzeb's tyranny. They settled in the forests and continued their guerrilla attacks on the Mughals. By now, Mewar under the Sisodiya raja Raj Singh (who was Ajit Singh's maternal uncle), had also revolted against the Mughals in protest against the jaziya tax. Aurangzeb retaliated ruthlessly. It is said around 173 temples in Udaipur and 63 temples in Chittor were destroyed by the Mughals. Raj Singh was defeated in the battle in 1680. Aurangzeb had himself marshalled the Mughal troops. After the battle Aurangzeb went back to Amer. But rajputs under Raj Singh and Durgadas continued harassing the Mughals through repeated guerrilla attacks. Aurangzeb then deputed his sons Akbar, Muazzam and Azam to counter the rajputs. But the three proved unsuccessful. Meanwhile, the Rajputs held secret negotiations with Prince Akbar, who desired to overthrow Aurangzeb. The Rajputs aligned themselves with Akbar but, sensing a rebellion, Aurangzeb personally led his army against Akbar. Aurangzeb then played a ruse against the Rajputs. He sent a letter commending Akbar for bringing the Rajputs to the Mughal camp, and he allowed the letter be discovered by the Rajputs. Naturally the Rajputs, especially the Sisodiyas of Mewar, were outraged and deserted Akbar. Only Durgadas saw through Aurangzeb's plan and remained with Akbar. Durgadas and Akbar then fled to the Deccan, where they took refuge with Sambhaji, the son of Shivaji. Aurangzeb made a treaty with the Sisodiyas of Mewar, under Jai Singh , son of Raj Singh, and pursued Akbar to the Deccan. Akbar later fled to Persia, where he died. Akbar's sister, Zeb ur Nisa, who had supported her brother during his rebellion, was also imprisoned by her father, Aurangzeb. The Rathores under Durgadas and Ajit Singh continued their struggle against the Mughals until Aurangzeb's death. In 1707, Ajit Singh recaptured Marwar and established an independent kingdom with Jodhpur as his capital. Aurangzeb's religious policy soon gave rise to more revolts; in Malwa, Bihar and Bundelkhand. Like Marwar, Bundelkhand broke away from the Mughal empire after Aurangzeb's death. Its king, Raja Chatrasal, established his independent state of Bundelkhand in 1707, with help from the Marathas. The Pashtun Rebellion of 1672 was a result of the moral lapses of the Mughal governor, Amir Khan, and his men in relations with a local Safi tribe in the Kunar region of Afghanistan. Discontent with Amir Khan flared into rebellion which was led by the warrior poet Khushal Khan Khattak. The rebellion led to the decline of Mughal control of the Pashtun belt and a closure of the Attock Kabul trade route along the Grand Trunk Pass. 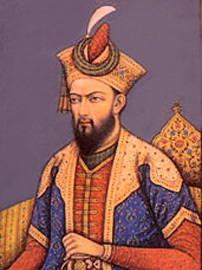 Aurangzeb's personal intervention managed to temporarily suppress the rebellion, but even so it eventually led to the decline of Mughal control over Afghanistan. The Deccan was to be linked to Aurangzeb for years to come. He had started as the governor of Deccan, during his father's rule. He had even constructed a city there, Aurangabad, named after himself. When he became emperor, he went back to Delhi, successfully ignoring the Deccan for some time. Shivaji, an upstart son of a Bijapur noble, had begun to challenge the mighty Mughal empire. He had already succeeded in carving an Hindu kingdom from the territories of Islamic Bijapur, Golkunda and some Mughal areas. Aurangzeb deputed Raja Jai Singh to tackle Shivaji. Shivaji was no match for Jai Singh's mammoth army, and he was forced to sign the Treaty of Purandar in 1665. Shivaji went to Delhi to meet Aurangzeb to discuss the specifics of the treaty, but he was humiliated and imprisoned by Aurangzeb instead. But Shivaji managed to escape and resumed his attacks on the Mughals, winning back all the forts he had surrendered under the Treaty of Purandar. He managed to resist all attacks by the Mughals until his untimely death in 1680. By now, the Mughals had annexed the kingdoms of Bijapur and Golkunda in the southern region of India. 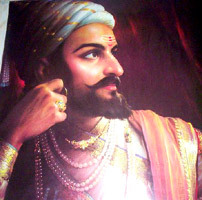 Shivaji's kingdom (in Maharashtra) remained the only challenge for the Mughals. After Shivaji's death, his son Sambhaji succeeded him, and as mentioned, the rebel Prince Akbar and Durgadas were given refuge by Sambhaji. Aurangzeb was therefore in no mood to forgive him. In 1682 Aurangzeb himself camped in the Deccan to take on Sambhaji, but Sambhaji managed to elude him and fought several small skirmishes until 1689. That's when he was captured by Aurangzeb and was imprisoned. Aurangzeb asked him to embrace Islam. When Sambhaji refused, he was put through the most heinous torture. His eyes were gouged out , his nails were pulled off and finally he was finally plastered alive in a wall. Sambhaji was martyred, but his death spurred the Marathas. 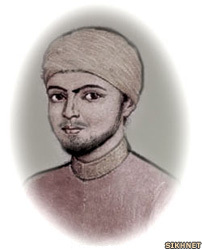 Sambhaji's younger brother, Raja Ram, carried on the struggle along with his queen, Taramati. They launched relentless attacks on the Mughals, one of them even on his camp. The Marathas were quickly becoming the Mughal nemesis. Aurangzeb was now almost ninety, a tired man and very frustrated about his lack of success against the resilient Marathas. He died on 3 March 1707, in Khuldabad in Aurangabad district. He was buried in an open grave. Aurangzeb could have been the greatest of the Mughal rulers, if not for his obduracy about his faith. After Aurangzeb there were more Mughal emperors, such as Bahadur Shah I, Jahandar Shah, Farrukhsiyar, Mohammed Shah, Shah Alam II and lastly Bahadur Shah Zafar. But none were competent enough, and they proved to be tools in the hands of their nobles or outside powers like the Rajputs, the Marathas, and finally the British. The throne of Delhi weakened after many invasions like those of the Afghans, Abdali, or the Persian, Nadir Shah. They looted, raped and pillaged Delhi. Soon, all respect for the Delhi throne declined and the empire splintered into several smaller kingdoms such as Hyderabad, Avadh, Bengal, etc. The subsequent decline of the Mughals was so pitiable that the later princes even faced starvation (as per accounts by historians like Dr Jadunath Sarkar). The descendents of the great Mughals are alive even now, but they live in abject poverty. Such was the rise and fall of the great Mughal empire.